Last week I wrote about a timeline art project we create while previewing our Social Studies text. Today I'm going to explain how I integrate content area objectives in social studies with ELA objectives. Our Social Studies content area objective is understanding the concept of Natural Resources, as well as learning examples of natural resources from each of the 5 regions of the United States. To build understanding, we create a concept web together. To create a concept web, I give a definition at the top. Then I give a couple examples, and take student examples. Next I talk about "non-examples" in order to correct misconceptions. For example, at the start of the year I focus on foods as examples. Lasagna would be an important non-example to cover, because although it's a food, it does not come directly from nature. Another non-example might be grass, because although it comes from nature, we don't eat it and it's not otherwise useful to us. I have these concept maps for Natural Resources, Products, Landmarks, Landforms, and Recreation available in my Northeast Region Unit. At this point we are ready to research Natural Resources in our first region (I start with the Northeast, because that's where we live). This is where our ELA objective comes in. I tell students that we have already skimmed the text through the "lens" of finding dates, but this time we will read the same text, all the while looking for foods. 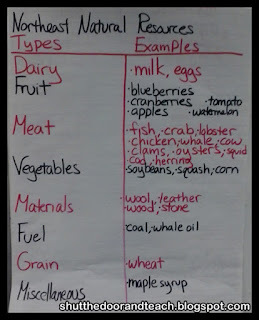 Students list the foods in their notebooks. I pair students up to read together by splitting the class into 2 (confidential) lists, one of the best readers, and one of the weakest. If I have a class of 20 students, I'll have the ten best readers read with the ten weakest readers. Number 1 reads with number 11. Number 2 reads with number 12, and so on. As students read, I circulate to help them process what they are reading. For example, in our text, there is a sentence that reads, "Coffee was imported from overseas." Guess how many students write "coffee?" If you guessed "about half," you've done this before. I explain a bit about context within the paragraph to make decisions about what to record. To build excitement about checking our work, we play a "beat the teacher" game. Using my test to guide my choices, I pick out the most important natural resources I want students to have on their lists. Let's say there are apples, trees, corn, maple syrup and cranberries. Instead of telling them those are the ones to study, I draw 5 tick marks on the board. Every student stands, and one at a time they read out one natural resource they found. If it's one of my 5, I erase a tick mark and add it to the list. If it's not one of my 5 but still correct, I still add it to the chart so they can see what has been guessed already. The object of the game is to have all 5 tick marks erased before they run out of "contestants." I love it because not only does it reinforce my Social Studies content, but as far as competition goes, there's not much pressure, and since it's me against them, I can model being a good sport whether I win or lose. Next we talk about organizing our list by type. I refer back to a lesson earlier in the year on sorting animals by type to start. (Clicking the link will bring you to the earlier post). This helps them before applying the strategy to our Social Studies content. As students offer categories, I demonstrate how to turn their list of examples two column notes. Modeling this process now helps with planning a response to reading later in the year as we tackle practice standardized tests. Then I introduce the concept of products on another Social Studies content map. 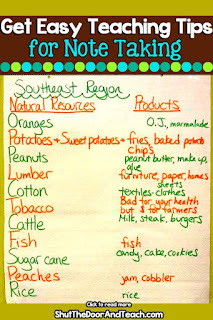 Students reread the text with the lens of finding products, as well as using what they know about the natural resources to list their own products. For example, since we are starting with a familiar region (and they learn a lot about apples in the younger grades) they know apples make apple pie, apple juice, and apple sauce. They create their own two column notes with the required natural resources I identified in our game. At the same time, there is some "backwards design" going on with the list. 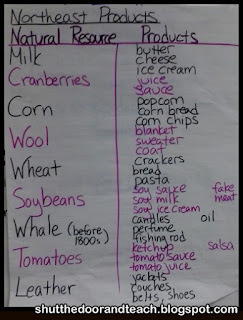 Students don't usually write "whale" as a natural resource when the first read the text, but at the end, they usually notice that there are many products that come from whales. The whaling industry was important to our community once, so we add this to the chart. Learning to record our Social Studies content research using these charts is an important start to organizing ideas before writing an informational text. 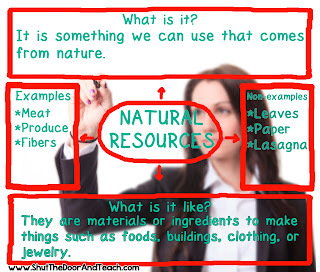 They draw from the natural resource side for main ideas, and the products side for details to write a paragraph. As we learn more concepts in social studies, these paragraphs become 5 paragraph essays. Later in the year, we compare and contrast two regions to synthesize ideas. Of course there are times in writer's workshop when I let them choose a topic to write about, but by starting out with a common set of knowledge in social studies, all students can learn the process of creating informational texts. Taking notes is such an important skill, and of course, it's not the only way 4th graders learn new content. Hands on projects that make real world connections are another powerful way to get kids interested in social studies content. In my next post on the empty box project I explain how I use FREE realia to make the regions relevant for my fourth graders!